The sales letter is the most important part of any direct mail package. It is estimated that in most cases 65% of your response comes because of the copy in the sales letter. Yet, it is the most frequently blown part of the mail package. Why? Most people simply don't know how to write a sales letter. And, if they do, they don't know how to write it for their target market. For that reason, I've compiled some information to help you when writing your sales letters. Next, take care in how the letter looks. Make your letter look personal. It shouldn't look starched like a white shirt from the fifties. Be sure your letter has an exact date and a salutation. Remember to indent paragraphs. Keep your paragraphs short and don't worry if your sentences are incomplete. You're not writing to win an award for grammar. This is not literature you're creating. This is a selling tool. Plain and simple. So use sentences like those last two I just used. Don't worry too much about the appearance. Some of the wildest looking letters get my clients the highest responses. Use simple words. Don't try to impress the reader with your vocabulary. If you do, you'll probably make him or her mad instead. The best way to write a letter is to act as if you're one of the people to whom you're writing. Write to yourself. What would you react to if you were getting the letter rather than sending it? Break up the copy with ever-so-short one or two sentence paragraphs . . . like this. Use bold, caps and italics sparingly . . . BUT . . . do use them where and when you should. Remember, the eye of the reader goes from the bottom to the top at an angle. So learn where to use special effects and when to use them. When you can, use a PS. That's what people read first. So, if you can, handwrite the PS and make what you say in it very important. Always use type that looks like the old typewriter type. Use type with feet. It's easier on the eyes. It's warmer. People like it. Give the reader a reason to reply. Give the reader a free brochure, manual or gift. Some readers will respond because of the "real" offer. But there is a percentage who will respond ONLY if you give them a premium. Then, use your second-stage mailing to reel 'em in. Oh yes, this is important. I see many letters that simply end. They don't tell the reader what to do. Tell the reader what you want him or her to do next. Do you want him to call you on a toll-free number? Do you want her to fill out a reply card and send it back to you? Tell them. Ask for the order. Or ask them to send back the card. And TELL THEM TO DO IT NOW. Your copy should look interesting, readable. Make people want to read on. Break up your copy with subheads, CAPPED words, a slash, color, parenthesis, underlining, asterisks and bullets. But, use them sparingly. Make your copy active and dramatic, exciting, inviting. Keep them reading all the way and going back for more until they post the reply card or phone in the order. Length is not important. I have clients ask me how long the letter should be. My answer: as long as it needs to be. If you're using a one-stage mailing, I suggest you tease with the first letter. Don't tell too much. Don't give too much away. What you want them to do is to mail back a card or other reply device to request more information. So please, do not tell too much. Do not give away the store. Simply entice the reader. Make readers want the information. That's all. If, on the other hand, you want an order from a one-stage mailing, by all means, tell it all. Tell it well. And make it sell. Whenever possible, make a money-back or satisfaction guarantee. People respond well to that. It gives them a sense of security. Remember, clutter sells. People like to scratch and peel and play with their mail. Look at the ever-famous Publishers Clearinghouse mail. Clip out the car you want. Peel off the gold star and paste it on the envelope. What a lot of work to win $10 million! But all that scratching and peeling works. People like to do it. And the more educated the person is, the more he or she likes to peel and scratch and punch. Hey, I'm no psychologist. Don't ask me why. Just know that that's the way it is and work with it. Make the reader active. Get them into the act. Get them involved with the mailing. The more you do, the greater your response will be. Susanna K. Hutcheson is a professional advertising and direct mail copywriter. She was the first copywriter to utilize the Internet as a place to market this type of service. Susanna has clients all over the world. She writes everything from Web site content to direct mail and radio spots. Visit her Web site at http://www.powerwriting.com. Her email address is powerwriter@powerwriting.com. Telephone: (316) 684-0457. Direct Mailers - Changing The Shape Of Things To Come. New Rule At The Post Office - Mailers are now allowed to mail irregular-shaped pieces without envelopes. It could be coming soon to a mailbox near you: direct-mail pieces designed in clever shapes ranging from an open box of doughnuts to a Zamboni machine. Nashville Predators season-ticket holders are getting an oversized pitch from First Tennessee Bank through this new opportuity in direct marketing. It's made possible by the U.S. Postal Service now allowing irregular-shaped mailings without envelopes. The piece was sent to 3,300 Predators season-ticket holders and offered $100 and a die-cast Zamboni piggy bank for opening a ''Predators'' checking account with at least $100. 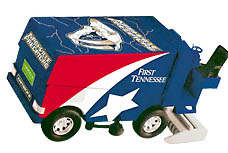 in the shape of a Zamboni or ice-resurfacing machine. The irregularly shaped format is catching on, in part because direct mail has become a more important marketing medium as new do-not-call laws restrict telemarketers and consumers see more spam in their electronic mailbox. Advertisers are searching for eye-catching ways to make their direct-mail pieces stand out in consumers' cluttered mailboxes. Great Circle Family Foods, a Los Angeles-based Krispy Kreme franchiser, reported top-notch results from an oversized mail piece sent to 10,000 homes within three miles of its doughnut shops. The piece dropped in mid-August, just two days after postal officials had announced new rules allowing bigger, customized, nonrectangular mail. The campaign netted an 8.5% response rate from area consumers, a 400% rise in response rate, the company told insidedirectmail.com, an e-newsletter. Another mailer to take advantage of the new regulations was a Memphis-based Internet company, Aristotle. It used an image of two overlapping 25-cent pieces as a pitch for low-cost Internet access. ShipShapes, an Illinois direct mail company, designed the Aristotle ad as well as Krispy Kreme's. Shawn Morris, president of marketing consultant SDM Associates said higher costs for producing and mailing custom-designed pieces could affect how fast the trend catches on. The pieces typically cost users such as First Tennessee $1 to $3 apiece, including printing costs and 57.4 cents for postage. The postage cost alone is nearly three times the 20 cents it costs to mail a traditional direct-mail piece. So are the irregular-shaped pieces a wave of the future? Direct-mail experts said that remains to be seen, though some companies have seen remarkable results already. Feedster.com - This search engine does for blogs what google did for web pages. Petitiononline.com - Free hosting of petitions. Thousands of active petitions & more than 15 million signatures collected.